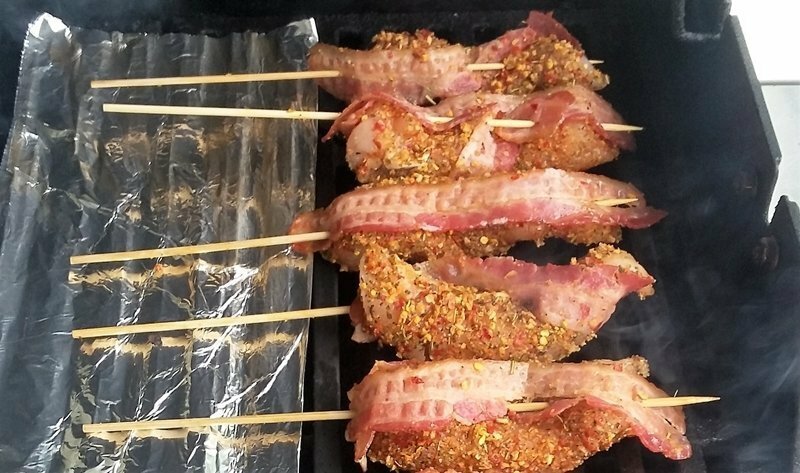 These grilled chicken tenderloin and bacon skewers make a great appetizer or can be an entire meal for light eaters. 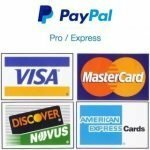 For this you will need a package of chicken breast tenderloin, pre-cooked bacon, bamboo skewers, tinfoil and Weber kick’n chicken seasoning, You may substitute any seasoning you would like. Pour a liberal coating of the kick’n chicken seasoning onto a plate or any thing that has a flat bottom . We used about half a container for 7 tenderloins. Remove the chicken from the package one piece at a time and roll it on the seasoning. Coating all sides and place onto a clean container. Repeat for all the pieces of tenderloin. What is a chicken tenderloin anyway? Cover the plate holding your seasoned chicken and refrigerate for 30 minutes to one hour. 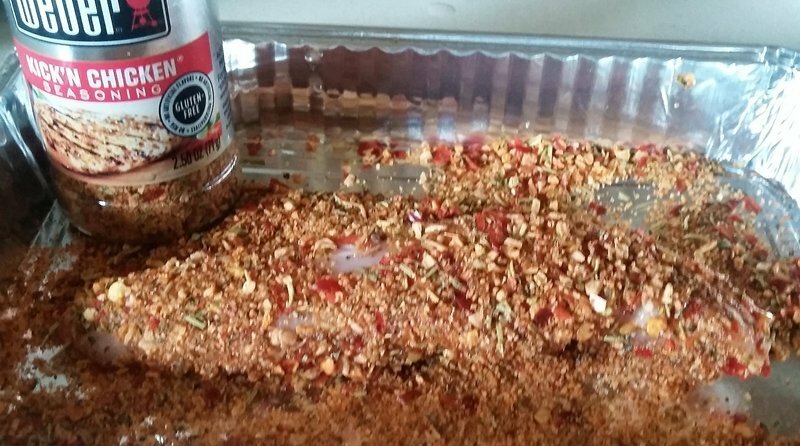 This allows the spices to penetrate the meat and they will also stick a little better when it hits the grill. When you are ready to remove the chicken prepare the grill. Add a layer of tinfoil to act as a skewer shield. 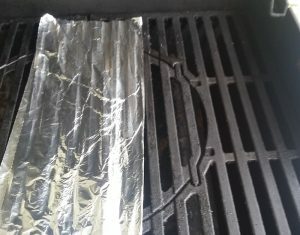 This is to keep the skewer handles from burning, heat the grill to a high heat. For our single package of chicken we will only require one burner. The bamboo skewers will be placed directly over the heat. 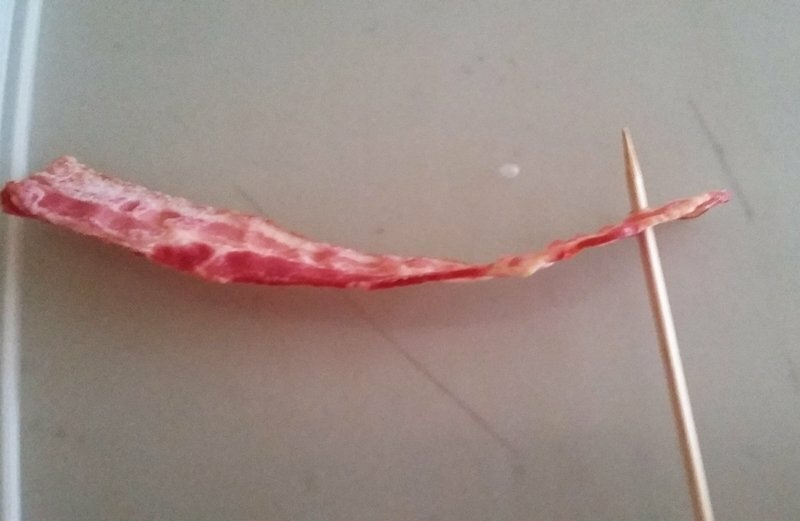 To make the skewers we start with the end of a precooked piece of bacon. We use precooked due to the fact that the grilled chicken tenderloin will be finished before the bacon can cook through. 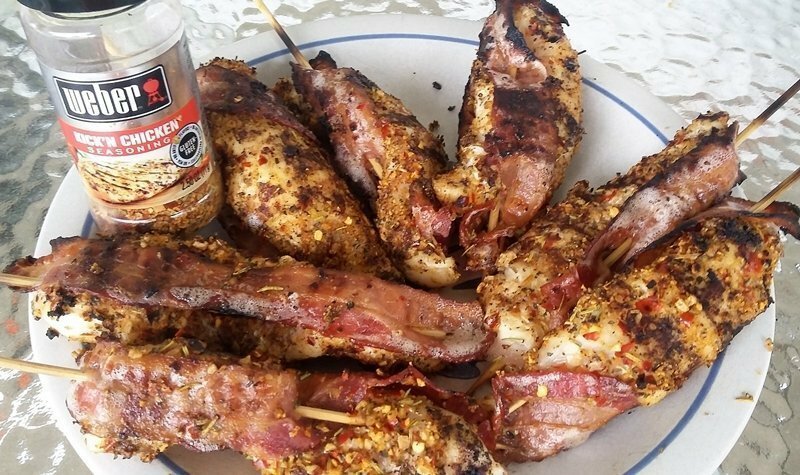 Weber Kick’n Chicken seasoning has a bright, citrusy flavor, swimming alongside the mouthwatering spiciness of onion, garlic and red pepper? That, my friend, is a hint of orange peel. Next is the end of the tenderloin while sliding the meat on bend the chicken, so the skewer can poke out of the middle. 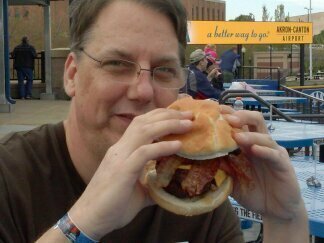 Next skewer the bacon again and back through the chicken and finally the bacon again. 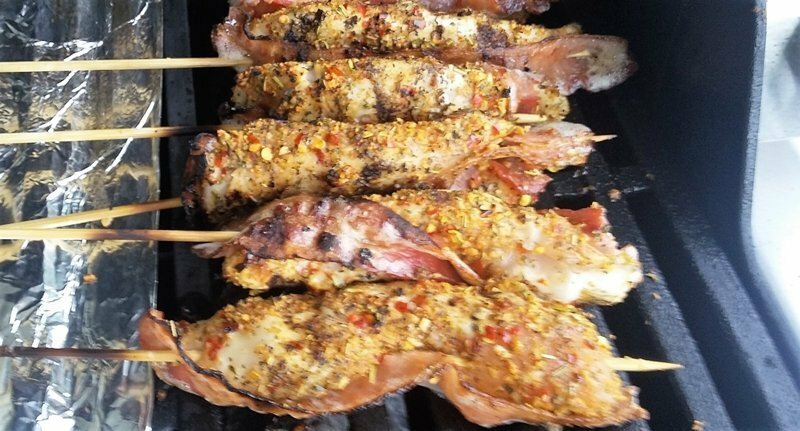 We tried several different approaches to the skewering, wrapping it around the chicken and such and we came to the conclusion that the bacon should just lay flat up and down the tenderloin. Take your finished skewers out to the hot grill and place them right over the flame. 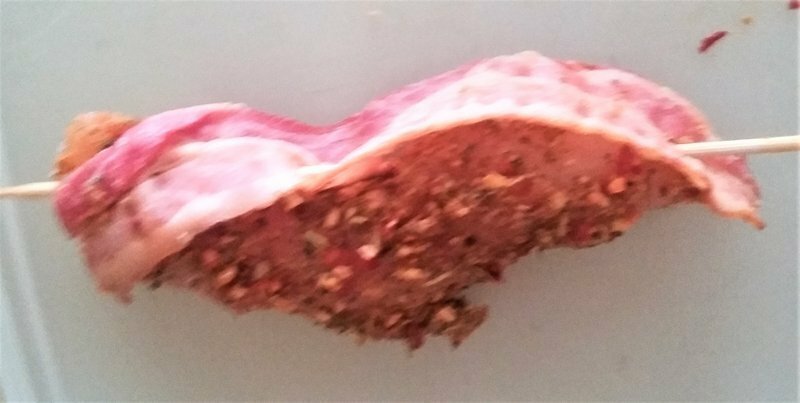 Tenderloins will vary in size and shape so be sure to place the thicker ones where it is hotter (typically in the center) and the smaller one where it is cooler. Grill with the lid open. Because grilled chicken tenderloin are basically round we will treat them as 4 sided and grill for 3 to 4 minutes per side. This all depends on how hot your grill gets. Because it is chicken we will check the temperature of the fattest part of the biggest piece so we don’t under cook it. 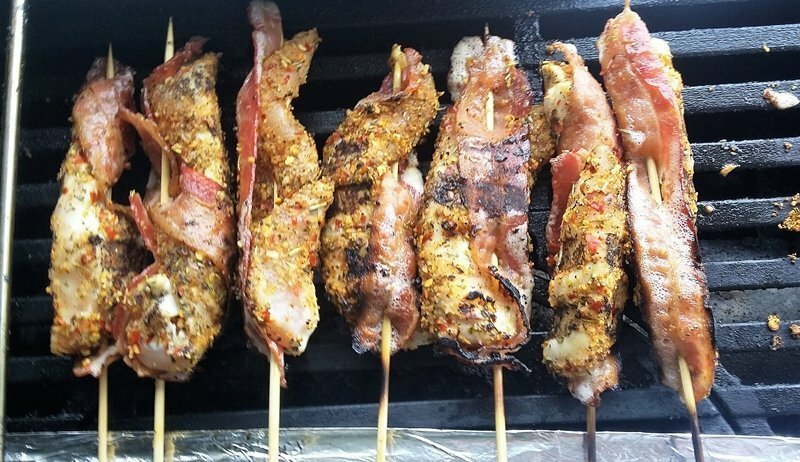 Because we used the Weber Kick’n chicken our grilled chicken tenderloin and bacon skewers turn out spicy and tender with distinct citrus flavor. The bacon adds to the flavor profile without taking over the dish. I would suggest a cup of ranch dressing for dipping the grilled chicken tenderloin in for people who can not handle the heat.